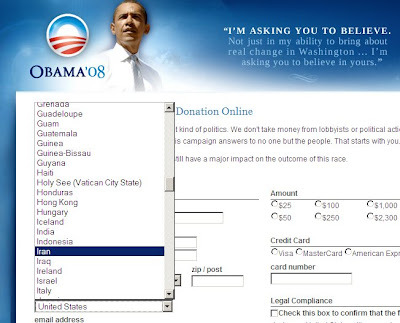 Barack Obama's electronic contribution site (https://donate.barackobama.com/page/contribute/abroadHP -- not hyperlinked for obvious reasons) accepts donations from countries like China, Iran, Pakistan, Saudi Arabia and Somalia -- although someone had the sense to remove North Korea from the list. The donor is only required to click a check-box, which attests they are legally allowed to contribute. No other presidential candidate allows such an easy channel for illegal campaign contributions. For example, John McCain and Hillary Clinton do not accept donations from abroad without a complete, written documentation packet sent via postal mail. It would seem to me that Obama's form is in direct violation of federal law. I think we should demand an accounting of these foreign contributions and his campaign should follow precedent by requiring documentation of legal status for foreign donors. When a corporate or biological person makes a contribution, does anyone check to see if the corporation is a subsidiary, wholly owned or otherwise, of a foreign corporation? When a biological person makes a contribution, do the state police throw them in jail if they aren’t carrying proof of citizenship with them? While Indonesian, Korean and other foreign interests contributed (invested) a few million to buy influence during the Clinton administration, the Mexican drug lords were paying Mexican generals a million dollars a week to facilitate their businesses. The Mexican generals were paid more per week for their influence than the U.S. president got per year from foreign sources. Our goal is to compete in world markets, but the Mexican authorities were bringing in dollars faster.